Home » News & Views » Education, Employment & Training » Exams:- Don’t Panic! Ah, exam season. The time of year where people get highly-stressed over exams. Some people even become ill because they worry so much. Well, you know what? There’s no need to get that worked up. They’re only exams. Yes, I said it. They’re only exams. Yes, they are important, but it’s not the end of your future if you don’t get all A*’s. You can only do the best you can. So, before you freak out, please remember that. Right, now that’s in your mind, we can stop fussing and flapping and focus instead on doing your best without getting ill or upset. 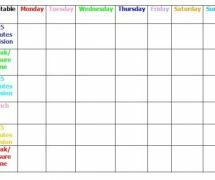 First thing I would do is set up a revision timetable. I’ve made one as an example for you which should be attached to this article. Feel free to use it. On there, you should be able to see “Break/Leisure time”. Use that space (which should last an hour or so if you want to get a lot of revision in) to do some relaxing or something to take your mind off exams – we don’t want to be getting too stressed or anything now, do we? 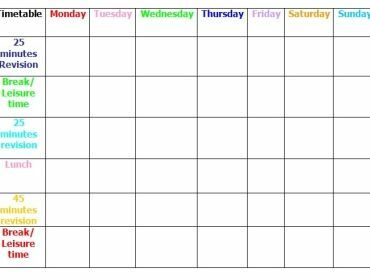 Obviously, the timetable I made is not going to fit everyone, so base your revision schedule on my timetable if you so wish. Highlight important points with colours. As much as possible, draw diagrams and maps. You can record the important points in your notes onto your mp3 or even into your phone. Listen to your recorded voice after. Make rhymes about key points or sing it to a tune. These will help you link each point to the other. Rewrite your notes. Rewrite them again and rewrite the key points using your own words. Write down key points you’ve learned using only your memory. Move around your study area. While you’re swimming or jogging or doing any physical activities, mentally review what you’ve been revising and recite them in your head. One important thing is being in a revision-friendly environment. So – no Facebook, no TV, nothing like that. Knock them off. They’ll be there when you come back. Sit down at a desk or table. Also grab a snack and a drink so you don’t have an excuse to get up from your work. You need to concentrate. Make sure all the equipment you need is with you. Things you might need could be a geometry set for maths, pens, pencils, a ruler, a rubber, highlighters, sticky notes, anything that can help you revise. If you’re making revision notes, try and get A3 paper to do this on. It’s got more room for you and you use less paper than if you use A4. Make it bold, colourful and memorable. After all, that’s what revision notes are for – to help you remember. Spider diagrams, writing out your notes over and over, big diagrams, mini glossaries – do whatever you can! If you have a lot of exams coming up – try focusing on the ones you’re siting first. If you have exams towards the end of June it’s best not to revise them just yet, the other ones are first so you need to focus on those or your head will explode. Not literally, but it’ll feel like it. If you really are struggling with a subject, go see the teacher in your free time or go to a catch-up session or if that subject has a club, join. It will be much easier when it comes to exams! Almost everyone feels nervous before an exam. Butterflies in the stomach and worrying thoughts – ‘Will I be able to answer the questions?’ ‘Have I done enough revision?’ – are indications of exam nerves that are probably familiar to all of us. A certain amount of nervous tension probably helps us perform to the best of our ability, producing a rush of adrenaline that helps us to feel alert and focused. However, too much anxiety can stop you from focusing on the exam itself and you just worry and think of all the worst possible things that could happen should you fail. That needs to stop. Now. I’ve added a video that a friend sent me a while back when I was really stressed. It really helped me, but in order for it to work, you need to focus. There’s loads of other ways to stop stress and YouTube is a good source for that. So, stop worrying as much, and focus, revise, relax and good luck for your exams! I wish you all the best marks you are able to get.